Starting a new era of high-performance SUVs in Pakistan, the Regal Automobile Industries has launched its PRINCE Glory 580 SUV that boasts some stunning features and technologies. Much to the delight of SUV enthusiasts in Pakistan, the Glory 580 features exceptional performance features, state-of-the-art technologies and a stylish design. 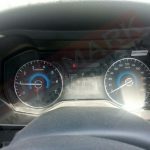 Glory 580 is a modern-day SUV that is all set to take on its competition in the closely contested SUV segment of the Pakistan car market. Glory 580 has an aerodynamic and appealing appearance that instantly grabs the attention of the onlookers and makes it a sight to behold. It is also a perfect family vehicle, thanks to a large number of advanced safety features offered as standard in the Glory 580. It is a 7-seater stylish SUV that thrives on its turbocharged engine and CVT transmission for a flawless ride regardless of the driving conditions. its stunning good looks. 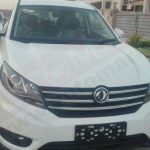 The front fascia of the SUV featuresa stylish grill withbrand’s badge placed in the center.The front-grille is flanked by Lion-eye shaped LED headlights with Daytime running lamps that are beautifully sculpted to complete the aggressive appeal of the front end. With a wide wheelbase of 2780mm, the Glory 580 features 17-inch alloy rimsthat accentuate the aggressive appeal of the SUV. The craftsmanship and subtlety of the design flow through the whole body towards rear-end that features sharp Dual C-shaped tail-lamps. Besides having a subtle yet aggressive exterior, the true highlight of Glory’s design is its interior. Delicately poised to welcome its occupants with contagious warmth, the interior of Glory 580 is an epitome of sheer design excellence, finesse and technological brilliance. 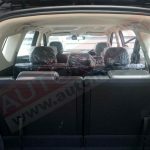 The cabin boasts a luxury appeal with an intelligent instrument cluster, leather upholstery, Dual electronic AC, ample leg room and head room for occupants and an advanced 10-inch HD LED with cell-phone connectivity feature. 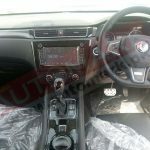 The interior of the vehicle has been built around the driver featuring engine push start button, a leather-wrapped multi-functional steering wheel and a smart information display behind the steering wheel. The Glory 580 has been designed to be ergonomic and spacious and can easily accommodate seven occupants while also offering enough space to carry language on holiday trips and weekend getaways with friends and family. PRINCE Glory 580 is also a performance-oriented vehicle that leaves no stone unturned when it comes to providing a breathtaking driving experience even in the most challenging driving conditions. It has been equipped with a 1.5-litre turbocharged engine paired with a CVT transmission that generates 147 horsepower and 220Nm of torque. These figures are exceptional and make Glory 580 a high-performance SUV, which will help it become a strong contender in the SUV segment of Pakistan car market. 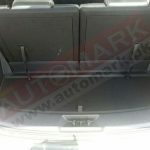 The fuel tank capacity of the vehicle is 58-litres while not much has been revealed about the fuel efficiency of the vehicle. Building up immense hype around this SUV is also its state-of-the-art MacPherson Independent Suspension that adds to the performance capabilities of the vehicle considerably. What sets the PRINCE Glory 580 apart from its competition is the availability of a plenty of advanced safety technologies as standard. Glory 580 is an absolute standout in the segment for its amazing safety systems and driver-assisting technologies that make every ride with the PRINCE Glory 580 completely safe regardless of the driving conditions. Here are the safety features offered as standard in the PRINCE Glory 580. 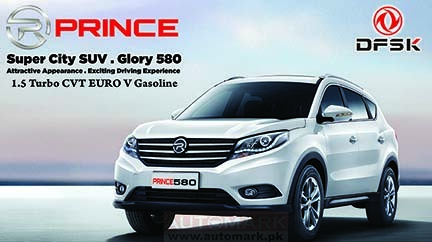 The PRINCE Glory 580 has been launched in the Pakistan market and it can be booked with a 4-month delivery time. 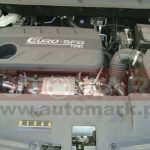 It has been priced at PKR 3,250,000, which is slightly expensive for a new entrant to the market, however, considering the exceptional performance capabilities and advanced technologies offered as standard, the price-tag is completely justified. 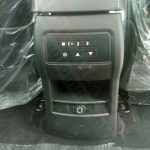 daftar harga mobil SUV – Chinese Automaker DFSK plans to release more of its sport utility vehicle (SUV) products in Indonesia in the coming years, said PT Sokonindo Automobile, which holds the right to the DFSK brand. Sokonindo Automobile sales center managing director Franz Wang said DFSK would focus more on the SUV segment, one of the most competitive segments in the automotive industry. “This is a segment that people like. DFSK will focus on SUV technology. This year, we introduced our first SUV and in the coming years, we plan to introduce more SUV products here,” Wang said recently during the ongoing Gaikindo Indonesia International Auto Show (GIIAS) 2018.